What is decannomics©? It is an elision of decanal, the adjective pertaining to deans, and behavioral economics, the application of psychology to decision-making. It is a shout-out to Freakonomics, which seeks to explore ‘the hidden side of everything’. It is about how better to facilitate or orchestrate the development of faculty in research universities and academic health centers. 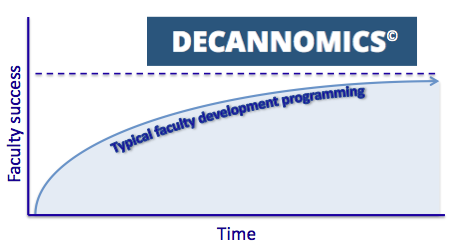 What is faculty development? It is academic, professional, and personal growth. It includes advancement in academic rank, but also every other aspect of what faculty do. It can occur throughout the faculty life cycle. Who is this for? It is for faculty developers such as faculty affairs deans and staff, unit leaders (chairs, chiefs, etc. ), mentors and coaches, those who assess faculty, and for faculty themselves. The state of the art in faculty development has advanced considerably. Decannomics is about what’s above the dotted line. The Roadmap shows the content and organization of the posts. These posts are not the official policy of The University of Chicago or its Biological Sciences Division, but rather the personal opinion of the author. this is going to be great- now get on Twitter and toot your horn.